A well-dressed tire makes a big statement about your ride, but first you need to get it clean. 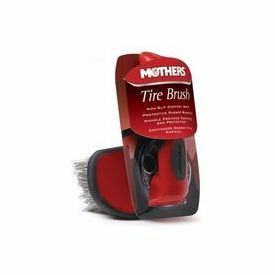 Featuring a contoured design that fits your tire's sidewall so you can clean them more easily than ever, the Mothers - Contoured Tire Brush has a non-slip comfort grip and lightweight design to help make tire cleaning easy. Ideal for use with Mothers® Tire & Rubber cleaner spray. Description Mothers Contoured Tire Brush Mothers Contoured Tire Brush has a definite advantage over other tire brushes because of it's subtle curve and wide brush area which helps to clean the tyres faster and with less effort.The handle of the brush is parallel to the brush head to give you maximum leverage as you scrub dirty tires. The rubber, textured grip gives you a comfortable and firm hold on the brush, even with wet hands.A well-dressed tire makes a big statement about your ride, but first you need to get it clean. Featuring a contoured design that fits your tire's sidewall so you can clean them more easily than ever, the Mothers - Contoured Tire Brush has a non-slip comfort grip and lightweight design to help make tire cleaning easy. Ideal for use with Mothers® Tire & Rubber cleaner spray.